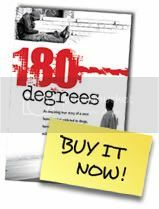 180 Degrees - The Story Behind The Book: The 180 Degrees Blog – Venice Beach, California! The 180 Degrees Blog – Venice Beach, California! Remember the time in the book where I mention we had three of us cramped in the one-bedroom Venice Beach apartment? Well – I thought it would be fun to show you exactly what I was talking about. As I revisited my old home, I was lucky enough to find the new tenant willing to let us walk through. You’ll see the living space, the kitchen area and the stairs leading up to where our tenant lived. It wasn’t easy paying my one third of the $895 rent in those days but it was also the beginning of the rest of my life and if it wasn’t for those building blocks, I can’t say I’d be here right now shooting this video. As you watch the video, you get to see the spot where my roommates and I would wake up to find homeless people sleeping overnight – some of them that we would know by name. My former real estate office is around the corner from where we lived and in this video I show you exactly where it was. In those days it was the John Douglas Company but since then it has become RE/MAX – and it was very cool to be able to see the building where I got my real estate start. The wonderful breeze of the Pacific Ocean fills the air and you can see exactly where the alley that led to the breakwater and beach was through which I would walk to go surfing. Though it was a nice area, we had a lot of break-ins in my car and we didn’t even have a door on our garage at that point. Here’s a great beach cam to see what’s going on Venice Beach in real time. This video would not be complete if I didn’t share with you the famous Thomas Hamburgers where I would get my breakfast, lunch and dinner ALL the time. Super cheap at the time, I have many fond memories of that place – right there on Washington and Pacific in Venice, California. Stay tuned for more exciting walkthroughs of the life and times of yours truly. It’s really neat showing you what I’m talking about in my book.